1) No arguments or altercations. I do not want fighting, I want fun. 2) You will PM me about these bijuu events or I may spontaneously post them, either or. Usually it will require you to do some work, not an audition, or me just giving them away. It is a topic and a retrieval that is required. 3) Have fun, and do not forget limitations. Do not god mod with a bijuu. Description: This bijuu controls the element fire, naturally the person of whom possesses this cat can cast fire type jutsu. Katon style. During the awakening of the bijuu inside them the chakra levels in the person's body will be upset and the balance will cause a slight change. By the time the person is able to sense a surge of power or energy surge through them, the second awakening (the full awakening) of the bijuu, their chakra reserves will have been multiplied by many. At the sign of the first tail the person has gone into full bijuu mode. They will sprout ears and a tail, and retain some of their human form. Their skin will turn dark, and their eyes, red. If the power continues to surge throughout their body and they go into full demon, the picture above is how they appear. This bijuu's power is great, it may burn down half of a whole village, and then some. Compared to a normal shinobi's chakra levels, this bijuu can double sometimes triple it. Description: This bijuu is in control of anything related to water. Within the limited field of course, it has control over the two items that go along with winter. Snow and Ice as well. The wolf's awakening is quite an exhilarating one. The person of whom possesses this bijuu, when feeling the first awakening will feel a surge of euphoria, a wave of euphoria come over upon their body. Suddenly they're muscles will loosen from prior exercise or tenseness. This is just the beginning, the second awakening, their chakra levels will rise, and the amount or reserves of it will augment. It will expand their casting jutsus to water elemental types, as in addition to whatever they already know. At the first tail, their eyes will change color to a grayish blue color with a snowy tint to it. 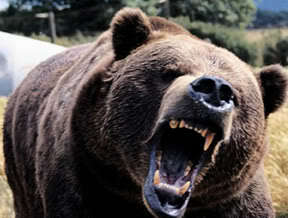 They will begin to show signs of animosity with slight blood lust and bent over position. 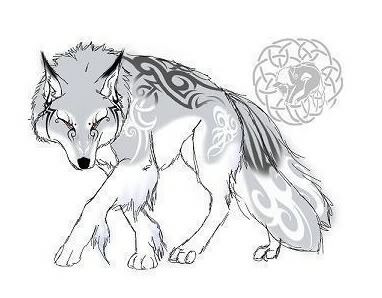 At the second tail, the jinchuuruki will walk on all fours like a wolf, sprout a second tail and grow ears. Their eyes will take the shape of a wolf's and grow intense more with blood lust. They will still retain human form with circulating chakra around them. 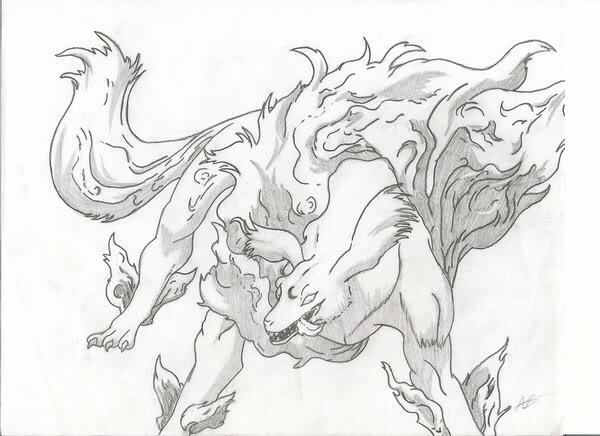 At full bijuu form, the features they have been given will solidify and the jinchuuruki will become a wolf with two tails themselves, able to use the most variety of their chakra and water elemental type jutsu. Description: This dragon has three tails to it, and control over the wind element. It may create winds that are severely destructive and strong. It can wreck villages, and once peaceful areas of concentration. The wind can range from a slight spring day breeze to a full on twister or tornado. The jinchuuruki with this bijuu goes through stages to awaken their bijuu's powers. At the first awakening, the jinchuuruki will start to feel the lightness of air. They may be able to move slightly faster, opening up their chakra reserves more, and lightening them, but by doing that making them grow by air. At the second awakening, the jinchuuruki will sprout wings and will be able to fly. They will be as light as a feather, and able to fly through the air. At the first tail of the bijuu, the jinchuuruki will be able to use wind type jutsu ranging from a calm spring breeze to a minor wind gun. Their speeds will have been increased on foot, to the point of being faster than normal running enhanced with chakra. Through the air they soar like a bird. At the second tail, the jinchuuruki's speed is increased more to more of an easy and quick glide through the air. The jutsu is between a major wind gun, and a minor tornado/wind dome. At the last tail, the jinchuuruki turns into the bijuu itself and its speed is increased completely, flying and running, faster than the human eye. The wind jutsu ranges from a completely tornado storm, to a twister devastation. Description: This is a bijuu of the Earth. It controls the rocks and is potentially the closest to mother nature herself. This element is an element of strong stances, and thus the user must be strong as well to work with the bijuu. If the jinchuuruki is weak, the bijuu will take over their body and soul, and they will never be the same again. At the first awakening of this beast, the user feels closer to mother nature, and they are able to see a bit clearer. As time gradually progresses, their senses start to get better and more innate. At the second awakening, they will be able to be in tune with mother nature and the things around it so well they can predict or sense what happens next and avoid or prevent it. 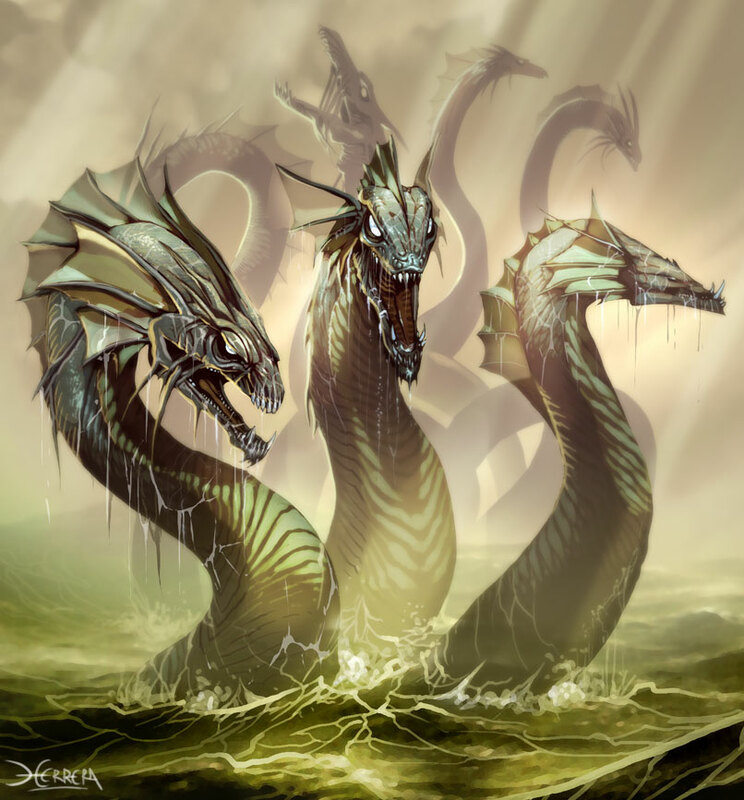 They require more attributes as a serpent, being quick to move, and silent in their movements. At the first tail they move quicker than the speed of thw wind, and can use D rank Earth jutsu. At the sign of the second tail, their chakra level grows and they are able to use B rank Earth jutsu. At the third tail, the jinchuuruki can use A rank Earth jutsu, and become a master of the Earth style. They can now move quicker than the speed of the human eye. At the fourth tail, they are silent and can move almost as fast as the speed of sound. They can use S rank Earth jutsu. Description: This is a bird bijuu in command of the light element. That means yes, it can heal itself. The light element is a bright and blinding element that can easily take your sight in battle for a certain amount of time, or blur it at least. It's also something that can be helpful as well as hurtful. The jinchuuruki has different steps to face with this bijuu. At the first awakening, they will feel surges of power throughout their body, and their chakra reserves will grow. At the second awakening, their chakra will split in two, one large reserve for healing, and the other for jutsu. The first and second tail appear together, this is the basis of power. 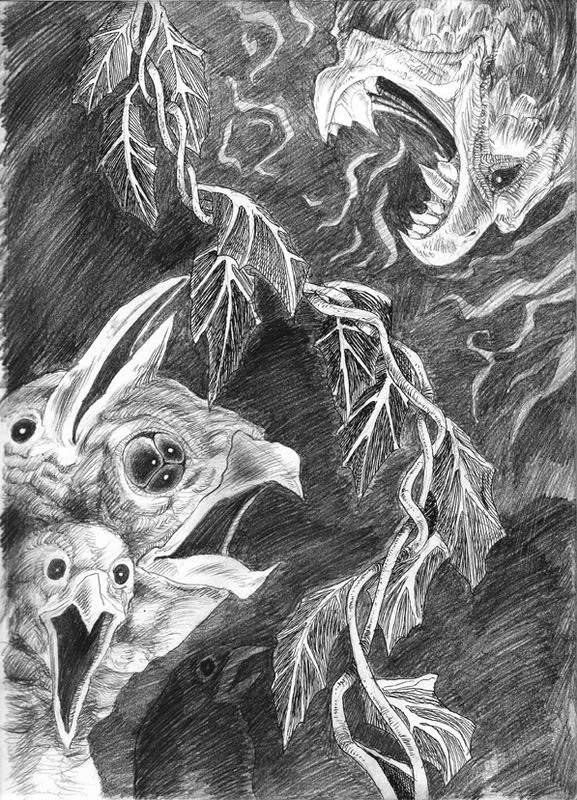 The jinchuuruki's eyes will turn red, and narrow like a birds. Their bodies will get fast and flimsy as if weighing nothing. At the sign of the third tail, the user will have grown wings and the ability to fly. However these wings are made of chakra and take a certain amount each time to use and maintain. It is at the fourth tail that the jinchuuruki's body will start to regenerate chakra faster than then the normal rate of their body's. It will always have chakra somewhere to use when reaching this tail however this is very risky. At the fifth tail, the jinchuuruki can remain human and move at speeds faster than the wind, and the human eye. Or they can change into the creature themselves. It is at this stage as well they can use lightning fast reflexes and blinding light jutsus. Description: This is the bijuu in command of the element Darkness. A very effective and mysterious element. It works well with ninjutsu and genjutsu especially. The jinchuuruki with this bijuu will go through several stages as well. At the first awakening, their power will surge through them. The second awakening occurs right after that, and makes the chakra reserves greater and more wide. They allow for healing, and for greater amounts of it to be used for stronger attacks. The jinchuuruki will start off after the second awakening with three tails. This is the basis for the main power of the bijuu itself. At the sign of the fourth tail, their eyes will turn a reddish black color. Their body will gain an aura of darkness around them, and they will begin to have a hunched position as if they have a hump in their back. It is at this point their senses are enhanced and they can see the distinct chakra in attacks. At the sign of the fifth tail, they are walking and running faster than the speed of wind on all fours. It is at this point they can use ninjutsu like dark elemental jutsu. Something that would injure the enemy in a physical sense. Say, B rank jutsu. At the sign of the sixth tail the jinchuuruki has a choice to remain in human form and use S rank genjutsu on their enemy. Or transform into the beast itself with dark flames on the sides of its legs. Description: This bijuu is in command of the element lightning. This is a VERY dangerous and risky elemental choice as well as a jutsu use. At the first awakening of this beast, the second awakening happens with it, or rather a second after. Very quickly power will surge through the person's body loosening their muscles and reflexes, as well as chakra reserves grow, and become larger and regenerate chakra as quickly as the jinchuuruki loses or uses it. The first, second, third, fourth, and maybe a fifth (depending on the persons power, control and rank.) comes out at starter tails. By the fifth tail their eyes turn a yellowish-orange, and have a slit in the middle of it, or what appears to be it, of black. Their hair gets highlights of red in it and they start to have a hunch. 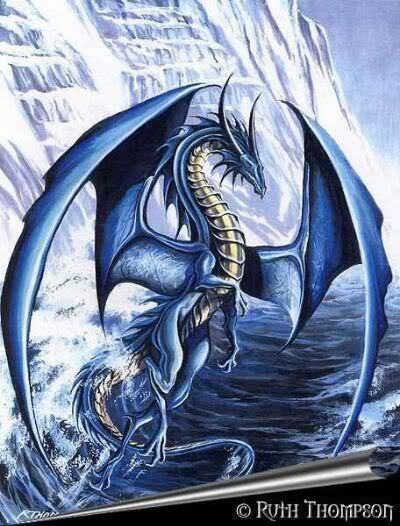 The sixth tail appears, and they walk on all fours, and are faster than the speed of the human eye. The seventh tail appears, and they can almost move just as fast as the speed of light. They can control and bend lightning to their will in jutsus that reach up to A rank. The jinchuuruki has to be careful not to shock or injure themselves with the control of lightning they have, it is risky. At the seventh tail they can choose to transfom into the beast themselves or remain in human form. Description: This bijuu's element is unknown and is still yet to be discovered in battle. The jinchuuruki with this bijuu usually tends to be a peaceful and composed individual that is opposed to fighting or anything violent really. Moreover a pacifist. At the first and second awakenings, they happen together, the chakra reserves increase. 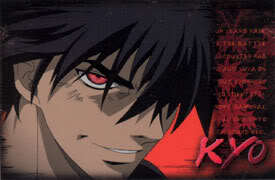 The jinchuuruki's speed and physical strength increases as well, as well as their rate of recovery. The first, second, third, and fourth tails are starter tails for the base of this bijuu's power. When the higher tails start to come on like, the 5 and 6th tails, the jinchuuruki starts to grown long fangs and their teeth hardened to an unbreakable material. 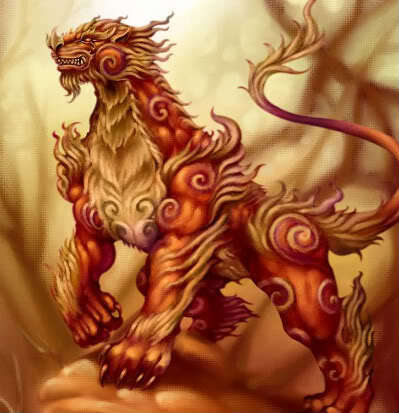 During the 7th tail, their body gets hairier, and the chakra is shown circulating around them like an aura. The jinchuuruki's eyes change to a black or a red, depending on the person and the final tail allows them to use S-rank jutsu. This is a very dangerous bijuu just from the claws. 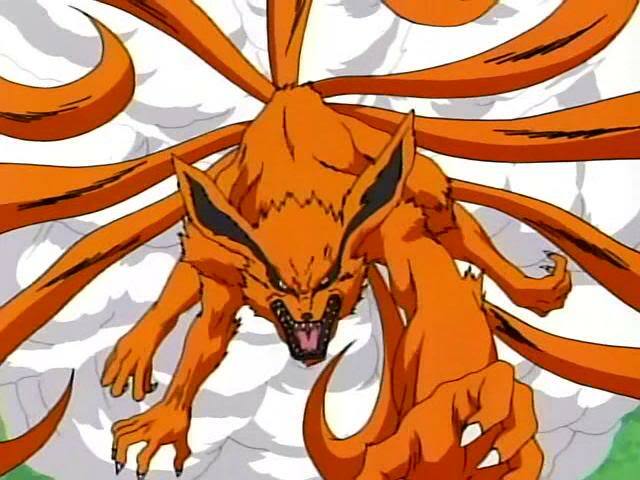 Description: This bijuu is the legendary Nine Tailed Fox. It destroyed villages and took on a role of mass destruction years ago. This was a terrible disaster and not even the strongest of shinobi could defeat a thing of such might. Even the grandest jounin were falling to their demise and lives were lost, so badly the healers could do nothing more than watch the horrors this beast had caused. The fourth Hokage and his might stood up to the beast and sealed it inside his infant son, Naruto Uzumaki. Years after Naruto's death protecting his village, the bijuu was set free to roam once more. However, its sealing and containment method has continued. As they have transferred it to someone new each generation. Who will have it this time? This is an incredulously powerful beast, those who handle it should be cautious. can i be the host of 8 tails bear? Sorry dude someone is already has that bijuu. then get on every once in a while lol....plus i find it weird...its like ur a alt or something o.O? I will be on once in a while and no im not an alt. Why do you think that anyways?